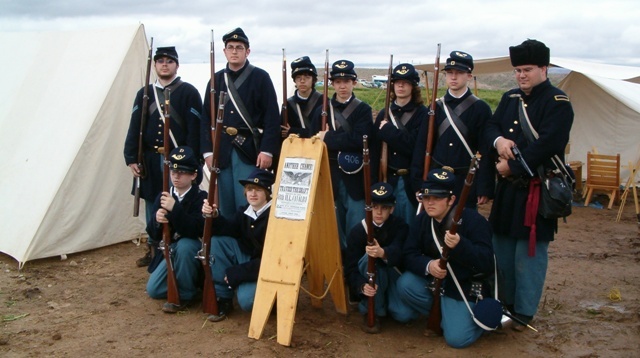 is part of the Boy Scouts of America "Venturing program", in the "Las Vegas Area Council"
Who are interested in the Hobby of Historical Reenacting. We primarily focus on the American Civil War in the Southwest United States that was fought in Arizona and New Mexico from 1861-1862. We also cover the years before, and immediately following the War Between the States. 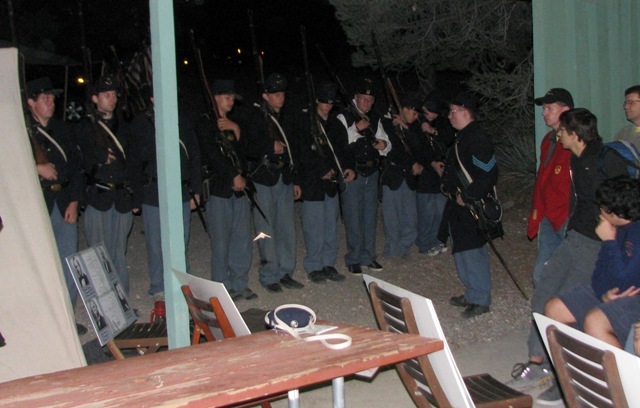 Our Venture Crew also works with the Southern Nevada Living History Association to allow glimpses into the era of the Roman Republic, the Mountain Men of the west, the Cowboys of the Southwest, and of course the more modern era of World War II. Not having been recognized by either Pennsylvania or New York, it was treated for a short time as belonging to the regular army, and its returns were made accordingly. This unit remained at Fort Schuyler and engaged in drill and discipline until the 1st of July 1861, when it proceeded to Fortress Monroe via Philadelphia, parading in the latter city, to the great credit of its officers and the satisfaction of its friends. Upon its arrival at Fortress Monroe the unit was assigned to arduous picket and scouting duty, and rendered important service in obtaining valuable information of the movements of the enemy while in the vicinity of Big Bethel. The 1st California Regiment entered its first major engagement at Ball’s Bluff, a lamentable affair in which the regiment suffered heavy losses. A crucial loss was the death of Col. Edward D. Baker at Ball’s Bluff, founder and political supporter of the unit. Without influence of Col. Baker the remains of the 1st California Regiment were then reorganized and claimed as a part of its quota by the State of Pennsylvania. The remains of four commands were re-designated as the 69th, 71st, 72nd, and 106th Regiments, and became the “Philadelphia Brigade,” Pennsylvania Infantry. Upon recovery from his wounds, inflicted at Ball’s Bluff, Lieut.-Col. Isaac J. Wistar became colonel of the 71st. Brig.-Gen. W.W. Burns commanded the brigade, which was attached to Sedgwick’s Division of the Second Corps. For more information on the 71st Pennsylvania, follow this link.